For most kids, the mere mention of Santa usually conjures up thoughts of a fat, jolly man, reindeer, a sleigh, elves, and of course, presents. While he usually invokes feelings of pure delight among all, I found just the opposite to be true for Anna. Terror comes to mind. 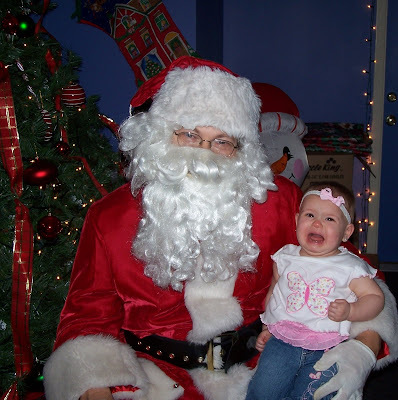 While we have chosen not to do Santa at our house, I have no problem having her picture taken with him. Now she on the other hand clearly had a problem with it.